A consultant psychiatrist working in the field of substance misuse and addiction, Dr Bowden-Jones was born and grew up in Italy where she studied medicine at Pavia University. She went on to train as a psychiatrist on the Charing Cross and Imperial College rotation in London. After her psychiatric training, she obtained a doctorate of medicine in neurosciences at Imperial. She is the founder and director of the National Problem Gambling Clinic, the first and only NHS clinic for problem gamblers. Until recently she also ran an inpatient ward for alcohol and drug detoxification. She is an honorary senior lecturer in the division of neurosciences at Imperial College and is the Royal College of Psychiatrists’ spokeswoman on problem gambling. What attracted you to psychiatry? I first decided to become a psychiatrist when I was seven. Everyone laughs at the reason. I was an avid reader of the Peanuts cartoons; a character called Lucy has a stall with a sign that says “The psychiatrist is in” and the other characters go and ask for advice on how to sort out their problems. She was my role model, as she was energetic and optimistic. During my childhood in Italy there was an epidemic of heroin addiction among the middle class population. The question of what would drive someone to destroy their life with drugs or alcohol was one of the early drivers for my interest in addiction psychiatry. How did you become interested in problem gambling? This began while I was studying for a medical doctorate at Imperial. I was undertaking research on the ventromedial prefrontal cortex of the brain of alcohol dependent subjects. I was using computerised neuropsychological tests, one of these was the Cambridge Gamble Task. I noticed that some of the subjects performed extremely badly and this led me to read up about the neuronal pathways involved in pathological gambling. The more I read, the more fascinating the topic became to me. I’m not a gambler and never have been. But from an intellectual, and then later, a human perspective, gambling really grabbed my attention. What evidence is there that gambling is a disease? Pathological gambling is recognised in both the ICD-10 (International Statistical Classification of Diseases and Related Health Problems, 10th Revision) and in the DSM-IV (Diagnostic and Statistical Manual of Mental Disorders, Fourth Edition) manuals. It has a prevalence of 0.9% in the 2010 British Gambling Prevalence Survey. There are hundreds of thousands of people out there in need of treatment. Research is still in its early stages compared with that of other addictions and we still need to clarify the neurobiological basis of the disease. What is the natural history of a gambling problem? How does it progress? There isn’t really a “typical” patient, but many of our patients start gambling when they are very young; they often report starting around the age of eight or nine. This could be playing cards with grandparents or being taken to the races. By their early teens, some patients are spending their lunch and bus money on gambling and return from school on foot without having eaten. Some give up university or lose their home because they have spent their money on gambling. Relationships also suffer because a person spends so much time thinking about or actually gambling that he neglects others. What sort of symptoms do people with problem gambling display? By the time people seek help they’re usually quite desperate. Their mood can be extremely low. They can also be gambling on a daily basis with a compulsion to seek out places to gamble. Patients often gamble excessively to the exclusion of other activities. Some don’t show up for work after a night gambling. Others become suicidal after incurring debts. Pathological gambling mirrors the presentation of other addictions and will be moved to addictive disorders in the DSM V from its current position as an impulse control disorder. How are problem gamblers treated? Research shows that the best outcomes are achieved using cognitive behavioural therapy (CBT) both individually and in a group setting. So this is what we provide at the clinic. We put most people in group CBT. The ones with serious psychiatric comorbidities receive individual treatment using the same steps, and all are offered family therapy and money management advice. At present there are no medications that have a specific licence for the treatment of problem gambling, but we plan to trial naltrexone in the near future. Is the internet changing gambling habits? The internet allows people to gamble at all hours and for as long as they want. The availability of gambling online makes it hard for someone to resist because of the ubiquity of the world wide web. People lose track of the time and money they’re spending on gambling and it’s easier for people to hide their addiction. By the time they come to us patients have often sold their computer and they are living hand to mouth. They’re still gambling but they tend to go to the bookies and queue up to play on slot machines. Are there any changes you’d recommend to gambling laws in the UK or internationally? We need to protect young people from the temptations of gambling and from starting early. Young people are currently allowed to play on some slot machines, but from a neurobiological perspective, this could be priming their brains and making them more sensitive to monetary rewards in later life. It is our national duty to make problem gambling fall under the care of high quality NHS services and to treat it as a public health issue in view of the preventive work that needs to take place. What advice do you have for those interested in psychiatry? I would certainly recommend a career in psychiatry. The rewards as a human being and as a doctor, when you help people love life again after having seen them suicidal or psychotic, are great. I love my work in addictions psychiatry. You have to be optimistic as you know some patients will relapse into their substance misuse or alcoholism, and there are challenges of keeping patients well with relapse prevention and medication. However, there are plenty of interesting research opportunities in addictions psychiatry, which is still young compared with many other medical ones. The Royal College of Psychiatrists is keen to support students who want to pursue a career in addictions. We also have bursaries and essay prizes for students. Further details can be found at rcpsych.ac.uk. This entry was posted on Friday, May 25th, 2012 at 7:18 am	and is filed under BMJ. You can follow any responses to this entry through the RSS 2.0 feed. You can skip to the end and leave a response. Pinging is currently not allowed. 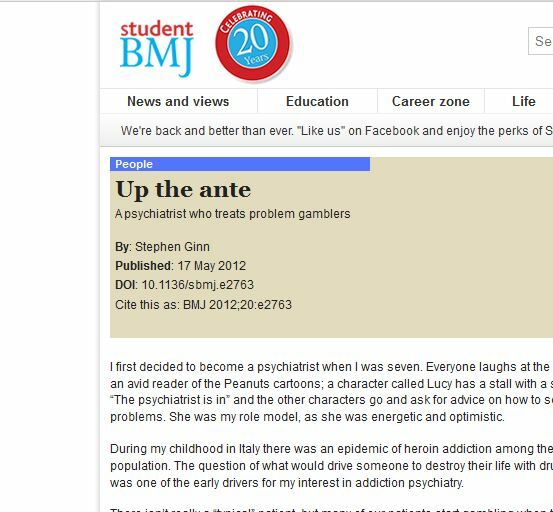 Why is CBT reserved for gambling and not other mental ‘illnesses’? lets see if we can break this down. All information processing systems are basically the same. In the case of transistors, we use what are basically looping circuits, these run at a specific frequency in order to perform their task. With neurons, it’s pretty much exactly the same, it comes down to on/off (firing) and the frequency at which they fire in a particular looping ‘circuit’ which we call a neural network. In this case neurons use what are called neurotransmitters to communicate, these molecules basically control the frequency at which the neurons fire. These systems have Feedback Mechanisms in them which are absolutely required to process information properly. Look at it this way, in order to push a boulder up a ramp one must know how far to push and with exactly how much force. One must know the angle of the ramp to determine how to apply force. How can neurotransmitters regulate anything between two neurons unless they know how much is being released and how much is being received? Problem for alcoholics: Alcohol binds to GABA receptors and basically amplifies the degree of activation of these receptors. GABA is an inhibitory neurotransmitter and basically reduces likelihood of firing. Also, Glutamate is are also occupied by Ethanol and they are blocked from activation. What happens: With chronic application, feedback mechanism try to overcome the disruption to allow normal information processing to occur again. Feedback absolutely does not merely meet the drugs, but overcomes their effect (by mechanism) with now an opposite problem. In this case GABA receptors are deleted or uncoupled to lower GABA receptor activation. Glutamate receptors increase in density to overcome blockade and free new receptors for glutamate to bind to. There are a number of other mechanisms that change as well, but lets focous on these. The alcoholic now needs to drink more to get the same effect, and when he doesn’t drink, the feedback that overcame the presence of alcohol now runs unopposed and MAN is that unpleasant alcohol withdrawal. When are alcoholic friend drinks, information processing is still disturbed by these feedback mechanisms, which are preventing even the presence of the alcohol from normalizing function. Thus, our alcoholic is basically losing the ability of his brain to properly process information whether or not he drinks. So our alcholic bites the bullet and stops drinking. The feedback mechanisms can now run in reverse and begin to go back to the original receptor densities. Problem is, information processing was disturbed for awhile, perhaps his brain’s neural networking has learned incorrect or error ridden things (by neuron connections) during the period of uncorrected alteration in the frequency of the neurons running his information processing organ. We can look at it this way, instead of making subjective interpretations of perhaps incomprehensible behavior, we can instead measure the degree of disruption of information processing with a QEEG, and then rule out the potential causes of disruption (such as drugs, or glucose energy metabolism problems) using PET scans. What does it mean? it means all psychotropic drugs are going to potentate feedback mechanisms and eventually harm the patient by producing cognitive and/or psychiatric problems with chronic use making it impossible to differentiate drug induced problems from an underlying problem. Research must actually be made into the cause of mental illness, not using psychotropic drugs. Currently QEEGs are basically useless because most published information is from studies where already medicated patients were tested with unknown premedicated readings which throws the results into the area of scientifically incomprehensible. If someone wants to be a psychiatrist, you should tell them to instead become a researcher. In my home county of the USA, according to the CDC (Centers for Disease Control) 49 percent of the population is on at least one psychotropic drug. There are 100,000 deaths every year as of 2008 due to psychotropic drug side effects. We have enough psychiatrists. We need actual research of something that’s not purely subjective like the occurrence of a behavior called ‘gambling’. I meant to say the above is what i would have written to that Stephen Ginn guy. The question of what motivates someone to choose psychiatry as a profession is something that intrigues and disturbs me because however many good, well-meaning, curious people there are working as psychiatrists, they are always going to be vastly outnumbered by those who simply dispense medication and don’t even believe it’s harmful. Indeed, I have come across psychiatrists who dismiss claims that their drugs are harmful as the imaginings of their ‘mad’ patients. So being a good psychiatrist must be a bit like trying to be a good cop in a Gotham City ruled by the Joker, except at least the Joker knows he’s a psychopath.